TRANSHUMANCE IS THE ancient custom of moving domestic animals from one grazing ground to another, as from lowlands to highlands, with the changing of seasons; sheep, cattle, and goats have all been involved in this annual domestic migration process. The origin of the word partially comes from the French transhumer, to move livestock seasonally. The purpose of transhumance is to move livestock to the cooler highlands to take advantage of freshly sprouted new grass. Animals were also moved from the lowlands up into the mountains to avoid the heat in the plains, particularly in FRANCE and SPAIN. After summering in the cool mountains, the process is reversed in late fall before snowfall makes passage difficult for the return trip. By the time flocks return, autumn rains in the lowland pastures have renewed growth to feed returning flocks. This tradition has been observed for centuries in Europe. The Romans noted transhumance as an ancient Iberian tradition. Visigoths at the geographical limits of the Roman Empire passed their own laws to allow for free passage of flocks during the annual move. Moors introduced Merino sheep during the 8th century, and their Berber shepherding methods allowed Spain to gain a monopoly on the fine quality wool, which, over the last six centuries, has become one of its most important industries. Herds are moved early in the spring, both to take advantage of the fresh grass and to avoid the summer heat, but also because most farms do not have enough pasture for large flocks. For centuries, farmers have burned their fields after harvest to remove dead and depleted vegetation as well as to reduce the acidity of the soil. This custom promoted the regeneration of nutrient-rich grasslands for their animals, as well as fallow time for croplands to recover. Practices such as transhumance lessened the stress to the soil caused by overgrazing. Transhumance appears to have originated, if not in Spain, then in the Mediterranean region generally, where the profound climatic variation between coast and mountain led to the development of a mobile pastoral economy. The Spaniard Gregorio de Villalobos is credited with introducing transhumance to MEXICO in about 1521, in the Gulf Coast lowlands when he imported some of the first cattle to New Spain. The colonial economy expanded and transhumance was widely practiced until the cattle ranches became so large they controlled the land that had been used by the native population. Disease eventually decimated the native population, and transhumance was widely abandoned in Mexico. In several European countries, transhumance still occurs, although in some regions it has developed into a both a celebration and a tourist attraction. René Tramier, president of “The Shepherds,” in Provence, France, was concerned that French children thought milk came from cartons. He helped to create an annual festival, Fête de Transhumance, in the town of St. Remy-de-Provence, which attracts both tourists and media. A tinkling of bells heralds the flock’s arrival as the Menon (castrated ram) leads the flock, whose progress is further encouraged by sheep-herding dogs. To prevent the ravenous flock from destroying flowers, shrubs, and vegetable gardens, villagers line the path, brandishing brooms and farm implements to shoo the sheep away from such delicacies. It was common in France for several herds to make the journey to the new grazing lands together, in groups of two or three flocks. The shepherds’ association would appoint a leader to manage each herd. The leader had an assistant and a shepherd with two or three dogs. One member was appointed to go before the herds and make arrangements for them to stop for the night, pay the farmers for the use of the grazing, and purchase any other provisions needed by the sheep or their handlers. To avoid traveling in herds too large to control, groups in the shepherds’ associations would leave several days apart and perhaps take separate routes, that led to a common meeting place. Cheese from ewes’ milk was made along the way. The abundant summer grasses, herbs, and wildflowers enhanced its flavor; Zamorano cheese from Spain and Roquefort from France are typical. In ancient times, landowners might only be paid in kind, in the form of milk and cheese, for the use of their land. Occasionally, the shepherds would purchase fodder for the animals if needed. In Spain, sheep and cattle ranchers labor to continue the tradition of transhumance, following the routes of their ancestors. But the arduous journey is made more difficult and dangerous by the modern expansion of highways into remote regions. Although the desire to continue the old ways is strong, modern technologies may ultimately cause the end of traditional transhumance in much of the world. As more and larger highways continue to encroach upon rural areas, herders find it increasingly difficult to drive their herds of sheep, goats, or cattle. Most animals are now transported by truck to avoid the arduous journey, but the cost involved can be quite high. In addition, some shepherds feel that the rapid change in climate is not as healthy for the animals as the trek on foot, which allows them time to acclimate. Yet another reason to move cattle by foot is that the exercise makes for finer, leaner meat. 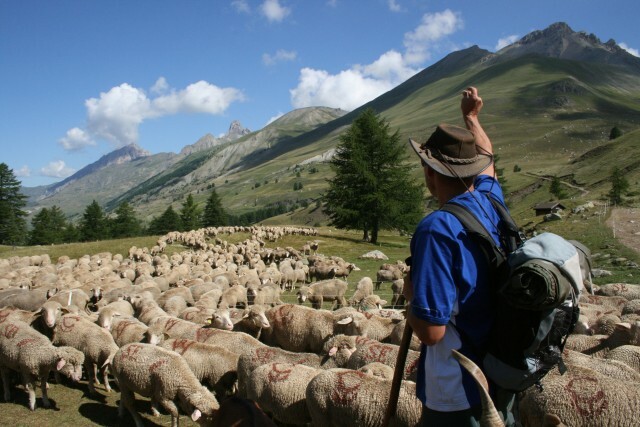 Transhumance has been followed in rural communities around the globe, including Scotland, Spain, France, SWITZERLAND, NEPAL, INDIA, North Africa, and ITALY. Archaeologists believe there is evidence of transhumance dating back thousands of years in Minoan Crete, during the period 2500 to 1400 B.C.E.